Half Acre has quickly become one of my favorite breweries, and it is Chicago’s best, in my opinion. I make an effort to try every one of their limited release beers, but a lot of times I keep going back to their old staples. 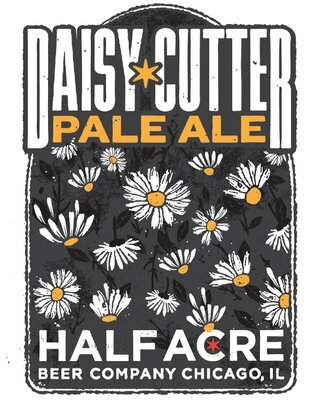 Daisy Cutter is one of their three main brews, and it is an excellent way to introduce someone to the brewery. The first thing you will notice about Daisy Cutter is its strong floral taste — hops are definitely abundant. Citrus flavors are also prominent, with the bitterness of grapefruits standing out the most. This is a beer that goes down smooth, and it’s something that even casual drinkers can appreciate. Daisy Cutter is available in both 22oz bombers and tall cans, and of course there is the option for a growler pour if you are in the area. Unfortunately, I don’t think Half Acre products are available much outside of the Chicagoland area. If you ever happen to come across Daisy Cutter, grab it. This is a highly drinkable beer full of luscious flavors, and it is a perfect summer beer (although it really is excellent during all seasons).